Inexperienced shooters frequently shoot low of their intended target. The most common cause of shooting low is for a shooter to push the piston forward as they press the trigger in a subconscious effort to brace for the recoil of the pistol. Initially, the shooter will not shoot low but after a few shots the subconscious brain takes over and causes them to anticipate the recoil, leading to moving the pistol forward during the trigger press. This forward movement of the pistol is difficult or impossible to see by the shooter or a coach in a normal firing sequence. However, when a shooter presses the trigger when the pistol is empty and they are not aware the pistol is empty you can easily see the forward movement of the pistol when they press the trigger. The easy way to determine if a shooter is anticipating and pushing forward on the pistol is to have a coach load the shooter’s magazines or revolver cylinder with some live rounds and dummy rounds. With live rounds and dummy rounds mixed in a magazine or cylinder the coach loads the magazine in the shooter’s pistol and racks a round into the chamber or closes the cylinder on the revolver. 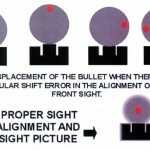 Then while shooting the shooter will not know when they are going to strike a live round or a dummy round. It will be very obvious when a shooter anticipates recoil as the pistol will move forward when they strike a dummy round. If the shooter continues this exercise through four or five mixed round magazines or cylinders it forces them to concentrate on a smooth trigger press without pushing forward on the pistol and with regular practice repeating the drill should correct the anticipation of recoil. Combining this drill at the range with regular trigger control dry practice in a safe area of the home will lead to good trigger control and eliminate pushing forward on the pistol during the trigger press.